You’ve finished the big lap, backed the caravan down beside the house to keep it safe from the weather until the next trip and, at that point, you have to hope your caravan cover is up to the job. After all, nobody wants to see the paint fade in the sun, a hailstorm give the aluminium cladding a belting, or tree sap or bird droppings freckle the paintwork. Finding the right caravan cover for your needs, at the right price, is quite a trick. What’s more, it’s even trickier to know which one does what job just by looking at it. Before you head off to your caravan accessory supplier and separate yourself from some of your hard-earned cash, make sure you know exactly what you are shopping for. It’s a more complex job than it might seem at first glance. All covers do not do the same job, nor are they all made the same. Let’s start by splitting them up into two general groups. First, there are covers under which you put the van into storage in the garage. These covers might do little more than keep the dust off and stop your pet cat from scratching the paintwork. Then there are, for want of a better description, heavy-duty covers. They’re designed to protect the van from bad weather, as well as protect the van against bird droppings and tree sap. Apart from their different uses, there may well be a significant cost difference between these covers. When it comes to caravan covers, the type of fabric is the key. After all, the fabric is all that separates your van from rain, hail, shine, dust, bird poop, tree sap or, perhaps, the grandkids’ crayons. A simple tarp-like cover might keep the sun off but it’s probably not going to do too much to prevent hail damage. And it just might cause a flood of condensation to flow under the cover like Victoria Falls in July, and that’s likely to introduce another set of problems. 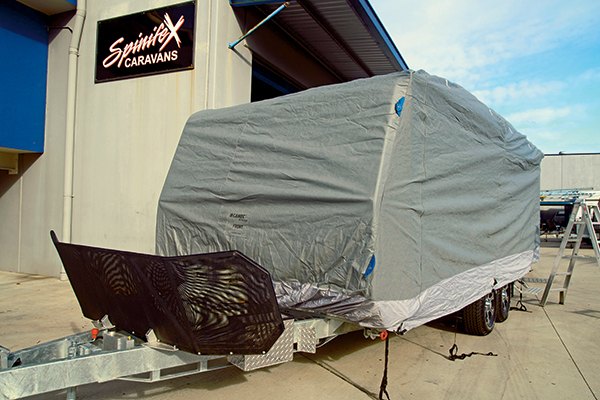 Caravan cover manufacturers have a tendency to give their materials whiz-bang names that make it difficult to distinguish good fabrics from bad ones. That’s a predictable tactic, given the highly competitive nature of the caravan cover market. So, perhaps, the best guide is cost. 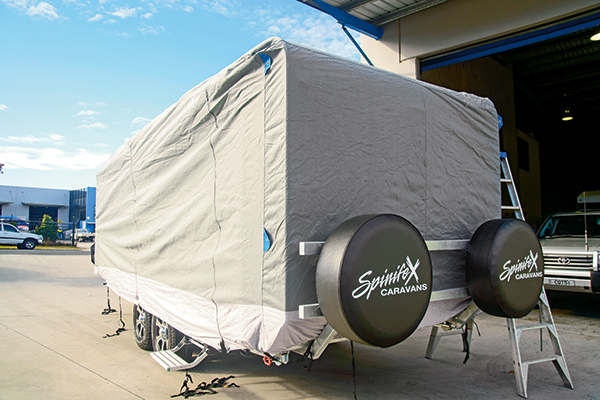 Online supplier of bespoke caravan covers Coverworld.com.au, based on Queensland’s Sunshine Coast, said buyers should be aware that the best cover fabric can cost about $30 per metre. At that cost, an off-the-shelf cover for a 5m van would see the buyer out of pocket a whopping $1000 or more. That means an off-the-shelf cover for just a few hundred dollars could be made from less effective fabric. But the quality of the fabric determines more than what it will protect your van against. Coverworld said the fabric quality also determined the lifespan of the product. Manufacturer Caravan Covers said quality covers were usually made of polypropylene rather than polyester and should be made of multiple layers for better protection. Each layer is likely to be made of different material, with each material providing different benefits. One of the key attributes of a cover is waterproofing, but the fabric also needs to be breathable to prevent condensation inside the cover. Sunshine Coast-based Stormcovers is also among the manufacturers that makes multi-layer covers. Stormcovers said its covers were designed with Australian conditions in mind. The foam-layered covers include a UV resistant polyfabric. This sort of protection will set buyers back around $1500. But it’s a small price in comparison to the cost of a caravan. Camec’s Premium Plus range, meanwhile, includes fabric comprising three materials that provide a combination of waterproofing with weather resistant, breathable side panels. The sidepanels allow moisture to evaporate while the van is under cover. It’s a worthwhile feature that resists rot and mildew. Camec covers also include a heavy-duty reinforced skirt with an elasticised hem front and rear to enable a better fit and to provide a guard against damage from sharp objects. Haigh Australia also boasts products with elasticised hems with reinforced material to protect against sharp objects, and belly straps to keep the cover snug and secure. Camec’s range promises protection against acid rain, industrial pollutants, tree sap, bird droppings, dust and weather damage caused by leaving the van uncovered and exposed to the weather. One of the better features of the Camec products is a soft, non-abrasive lining, which means the cover is less likely to scratch the van as you slide it on or off. 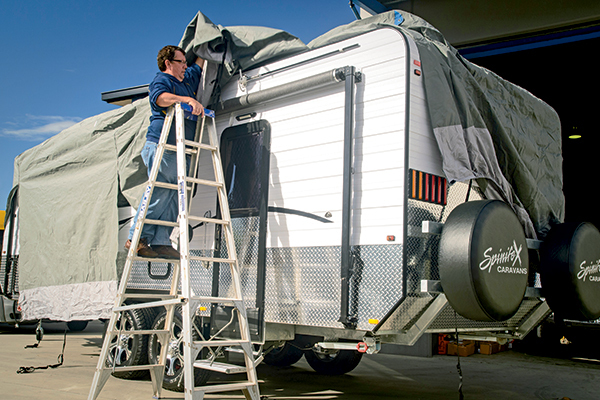 In line with Camec’s approach to providing covers made of multi-layered fabric, Caravanworld.com.au makes a fabric that has UV, mould and mildew inhibitors, treatments that repell water, and more. The design of a quality cover comes down to the details. It’s the details that determine the cover’s usability. There is no point paying a budget price for a cover that you just can’t use or doesn’t perform because it’s too hard to use. How you decide to use the cover will, in part, determine what features will work best for you. There are several aspects to cover design that can improve usability. Some covers include door and window access, elasticised hems to help improve protection, fixing straps that are integral to the cover, zips or velcro sections to aid installation, or transparent material to sit across the windows. If these sorts of things are important to you, remember that they come at a cost. Of these, door access is arguably the most important. This is because, even if your caravan is not in use, you still may need to access it from time to time. The simple fact is, removing and replacing a cover every time you visit your caravan or motorhome in winter is not fun. Generally, door access is provided by a zip or sometimes a velcro feature. For example, Haigh Australia’s pop-top cover CPV13R is designed with a rear-zippered panel while its larger CPV14SR is designed for both rear and side access. Fit is critical. 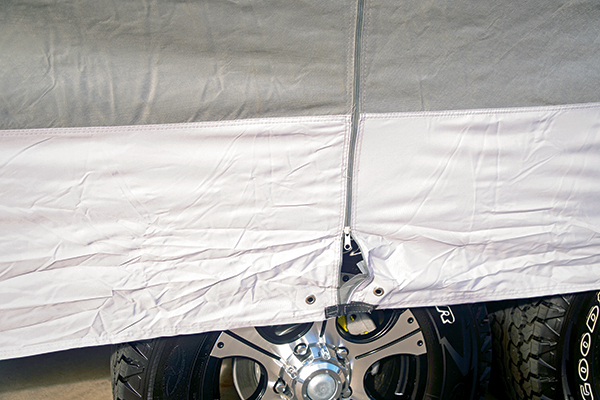 If you buy a cover that’s too large, then all you need to add to the mix is wind, and the excessive material will rub and tear at the covering of your caravan, camper or motorhome. The next problem is buying a van cover that is too small – the outcome is obvious and it will clearly be an ineffective cover. What’s more, a really tight fitting cover is harder to get on. Obviously. One solution is to buy a bespoke cover. Alternatively, if the idea of purchasing a tailor-made cover makes you worry about the cost, then look for a cover that is well equipped with strapping to ensure that you can properly secure the cover and create a tight fit. The tip with ready-made van covers is to take note of how well the straps are secured to the cover. 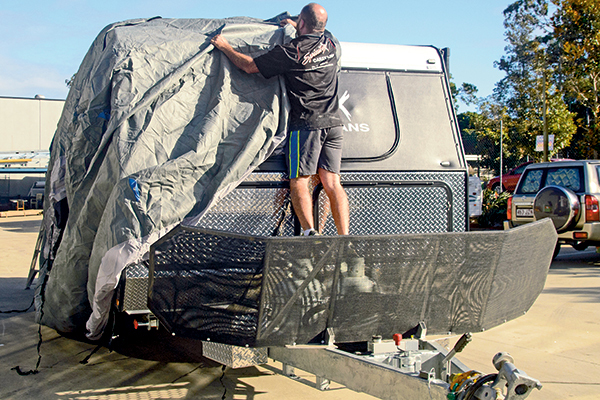 When it comes to fitting your cover, some, such as Coast to Coast’s new range, have tackled the problem of dragging the cover over your caravan. Coast to Coast covers use a device that enables owners to lever the cover over the van from the ground up. 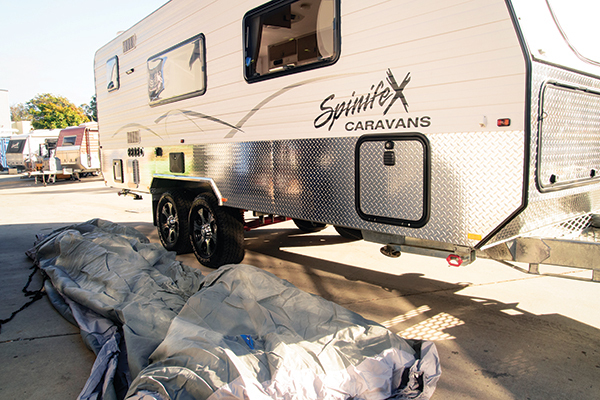 Although cost is probably your best guide to buying a suitable cover, once you have one it’s worth remembering to be sure that your RV is free from water and grit before fitting it.